Pattern Review is having its Knock-Off Contest, which is one I always enjoy so I wanted to get in on the action. I chose this Derek Lam dress as my inspiration. When I first looked at the Derek Lam, it appeared to be a match for Simplicity 2615. However, when I went back to look at it, I saw that it is actually a wrap dress (at least to the waist), though Saks erroneously described it as "V neck." Further, the neckline is created by bands and the dress is gathered into the bands. However, at that point I had already cut out the Simplicity Pattern and wasn't in the mood to do a complicated knockoff so I just stuck with what I had. The pattern is designed with a center front seam, which is left unsewn to the neck opening. I don't much care for the look of a center front seam, so I cut the CF on the fold. I thread traced the centers front of the facing and the dress, then lined up the centers and sewed a V to create the front opening. It took me a couple of tries to get it perfectly placed, but in the end I am happy with the opening. The fabric is very lightweight and I did not interface the neck opening on the dress, which was a mistake. I had to retrofit some interfacing into the corners on the dress. As with my 1946 dress, I used Beth of Sunny Gal Studios' clean finish technique for the facing. 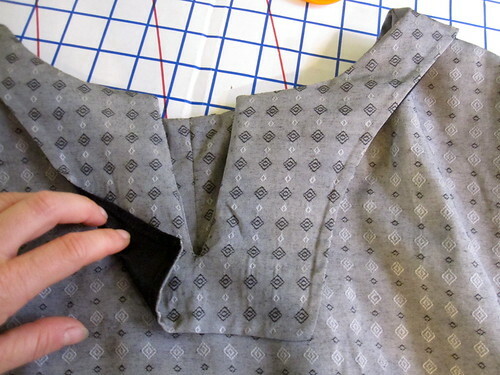 It involves sewing the interfacing to the facing, right sides together, along the outer edge. Then you flip the interfacing to the wrong side and fuse in place. 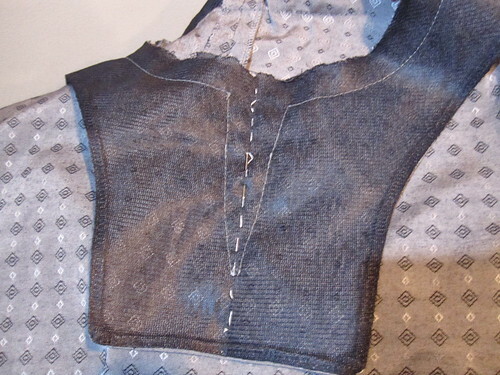 This time I sewed the shoulder seams of the facing and interfacing separately. I trimmed the interfacing shoulder seam to within 1/8 inch of the seamline. It creates such a neat finish! If you have to have a facing (and I hate them for their floppy ways), this eases the pain a little. This dress is truly a bust. I like the pockets, but that's about it. The combination of gray color, the pattern forming a horizontal stripe, and the unfitted style all add up to Prison Matron Chic. I tried to add a little interest to the sleeves by adding epaulet tabs. The tabs have lace on them and I sewed a decorative button at the top (the tabs are permanently sewn on). But maybe the military reference just makes the prison matron look even more pronounced. Dressing it up with a colorful obi and statement necklaces likewise fizzles. I do not finish 100% of the projects I start, but UFOs are not a problem for me. In this case, I wish I could have been able to just call it on this project and throw it away. But I felt compelled to finish it and spent way too long futzing with it, trying to make it wearable. I'm not sure I will even wear it once. I think it will just go directly into the Goodwill pile. Alas. But now that it's done I can finally move on to something else! I was really drawn to this pattern, but I'm not sure I will give it another try. I think it might be more suited to a top than a dress and in a crisper fabric than I used. But do I want to risk another cut of fabric on this? I'm not sure. I assume you probably gathered I am back from the Netherlands from the fact that Cidell has been posting like a mad woman. I don't have that kind of stamina. I spent last week going to bed very early to get over jet lag rather than editing photos and writing posts! I have finally finished posting all my photos--you can see them here. All the mad sewing paid off, even the very last "just one more" project, which was the gray wool jersey shrug. I ended up wearing that a lot! More details to come about the trip and the wardrobe! I can't believe Cidell and I leave on our bike trip tomorrow!!!! I have been sewing like crazy (as per usual for trips), each time saying, "This is the last one, I promise." I was not supposed to set foot in the sewing room last night, but I found myself sneaking in a wool jersey shrug at the last minute. When I confessed my inability to stop sewing, I was accused of fitting the profile of this Onion article. Lol. OK, that is a little crazy, I admit. I made a list three weeks ago with 7 things on it; I finished the list and made an additional sweater, shrug, and the packing cubes. It's been a busy three weeks! But worth it! I started packing last night and was just tickled by my rainbow of clothing, building on the items I sewed for the mini wardrobe contest. 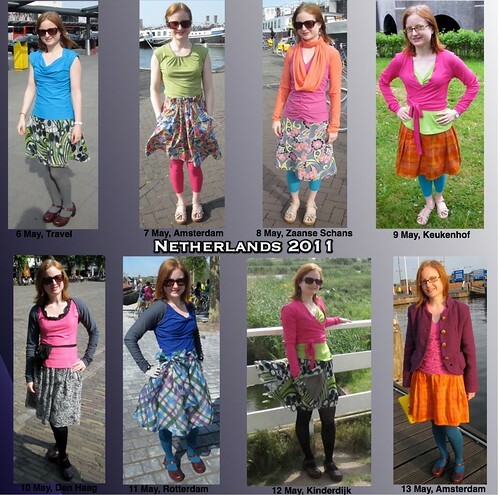 Each top goes with at least two skirts and vice-versa. 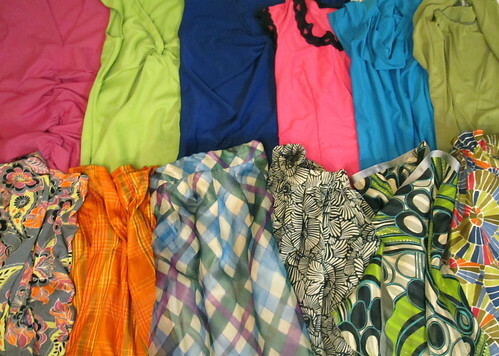 I am bringing 6 skirts and 6 tops for 10 days of clothing needs, so one of each will only get one wear. I tried to pare down a skirt and only bring 5, but honestly I felt like I would have been leaving one of my children behind. Not sure I should admit that. There is no wifi on the boat so I am not bringing my computer and likely won't post again until I get back. Cidell is my best photographer so I hope to have lots of great pictures of all these projects to show you. Cross your fingers for blue skies! Cidell and I have been doing training rides for the trip, and on our Gwynns Falls ride we stopped at DeBois Textiles. What a fantastic thrift/vintage store! The front is a well-curated collection of vintage clothing and shoes, extremely well-priced for the vintage market. The front also has a surprisingly large collection of textiles (hard to tell if they are vintage or not). The textiles are mostly home dec, but I did find one fabulous piece that can be used for garment sewing. 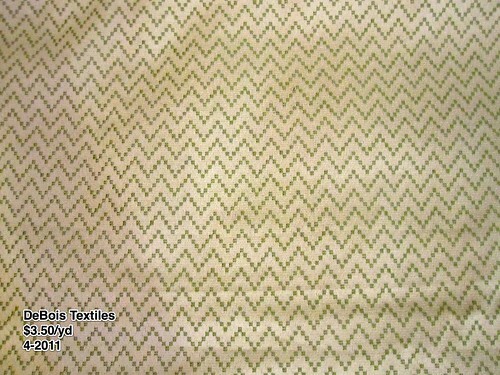 I didn't make the photo very exciting, but it's a jacquard in off-white and my favorite shade of green. How perfect is Burda 05-2011-108 for this fabric? I didn't even realize until I looked at it again that it calls for jacquard, and recommends using both sides of the fabric--which I was planning to do. The pattern is perfect for me as it is both professional (with some more shoulder coverage) and bikeable. The holy grail!